Friday saw the BHRE/LUPC Symposium at the University of Greenwich, with the title of “Socially responsible public procurement: Protecting and promoting human rights as we purchase”. BHRE is the Business, Human Rights and the Environment Research Group at the University, which has been one of the leaders of the movement to use public procurement as a lever to improve human rights in global supply chains, along with other notable participants such as with LUPC (the London Universities Purchasing consortium) and Electronics Watch. The issues include “modern slavery” but also other human rights abuses such as denying workers rights to representation, forced overtime, health and safety issues (including grossly unsafe working conditions) and other transgressions from the employer side. The event attracted around 40 delegates – fewer than last year which was a deliberate strategy, as was the half-day format rather than a full day, all because the organisers found last year’s bigger event a heavy workload, so decided to slim it down a bit. The more intimate setting was good for discussion anyway. After introductions from University of Greenwich hosts including Olga Martin-Ortega of BHRE, Andy Davies of LUPC and David Hansom of law firm Clyde and Co kicked off the afternoon working sessions with an update on progress in socially responsible public procurement. After an introduction to LUPC (celebrating their 50th anniversary this year), Davies explained the scope of the problem – 21 million people in the world are estimated to be victims of forced labour. That’s more than the number of victims of the historical slave trade we’re all familiar with, while the National Crime Agency thinks there are “tens of thousands” of victims in the UK. The Modern Slavery Act in 2015 required larger commercial organisations to publish an annual statement on the topic, Davies reminded us, then Hanson spoke about both the regulatory framework and what public sector buyers can practically do to encourage the right behaviours by suppliers in this field. He spoke about the grounds for exclusion under EU procurement regulations such as “grave professional misconduct”. Providing misleading information can also lead to exclusion. But there are difficulties in applying this – for instance, is the bidding entity really the same as the one that misbehaved? (it might been a subsidiary for instance). Some of the early statements Hansom saw from companies were “pretty rubbish” but they are getting better. The UK government supplier assessment now requires bidders to self-certify that they have published a statement, and this is a discretionary exclusion factor. The discussion moved onto Brexit – might the UK exit lead to a “race to the bottom” as the UK becomes a low tax, low regulation environment, Hansom asked? Who knows … I guess most of us hope not. 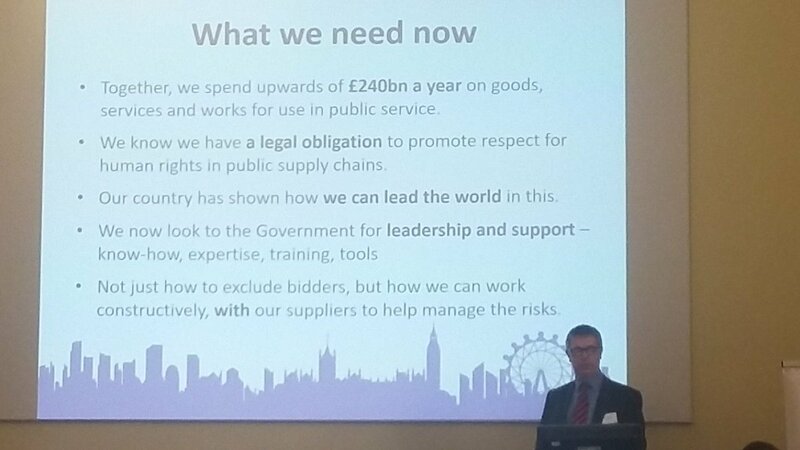 Davies then updated us on progress in government – for instance, a “Tackling Modern Slavery" guide from the Local Government Association, and the Mayor of London’s Responsible Procurement initiative. The Gangmasters & Labour Abuse Authority has also made some very good videos, available on their website and covering key issues such as how to go about reporting modern slavery issues. In healthcare, the Labour Standards Assurance System is now reaching maturity, but Davies wasn’t sure whether the appropriate requirements have been included in the new NHS “Future Operating Model” supply chain contracts. Things are also beginning to happen in central government, with a Home Office pilot for instance, and Crown Commercial Service taking these issues more seriously . What do we need now? “We look to the government for leadership and support – know-how, expertise, training, tools. Not just how to exclude bidders, but how we can work constructively, with our suppliers to help manage the risks”, Davies said (see his slide below). Sounds good … and more to come from us on the event shortly.